We are Acme Exports Manufacturer & Exporter of all types of Copper Moscow Mule mugs . 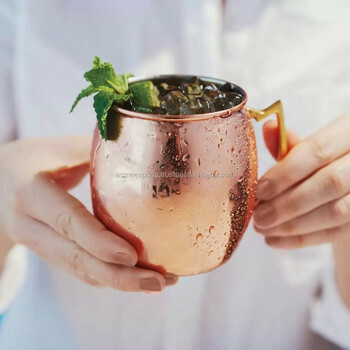 We Provide High Quality for Pure copper moscow mule mugs To our clients so to Avoid Damage of Goods we Secure Every Box with six sided 1 inches Thermocol. We use 5 Ply Box in Inner Box and 7 Ply Carton in Master Box. We Provide Door Delivery As well as Delivery to the port or Airport. We are Regulary Exporting Copper Moscow Mule mugs from the last 3 Years on Regular Basis. We are provide personal Stamp on the Mugs. We also provide Customize box. We also provide Copper Moscow Mule mugs Customise Design as per our customers Requirements.